Tourism just isn’t part of the Moloka’i vocabulary, and that’s the way the locals want to keep it. As a result, the island attracts a different kind of visitor; one who doesn’t mind that the population is barely double my high school, that there’s only one place of accommodation, or that the occasional gecko may find its way indoors. 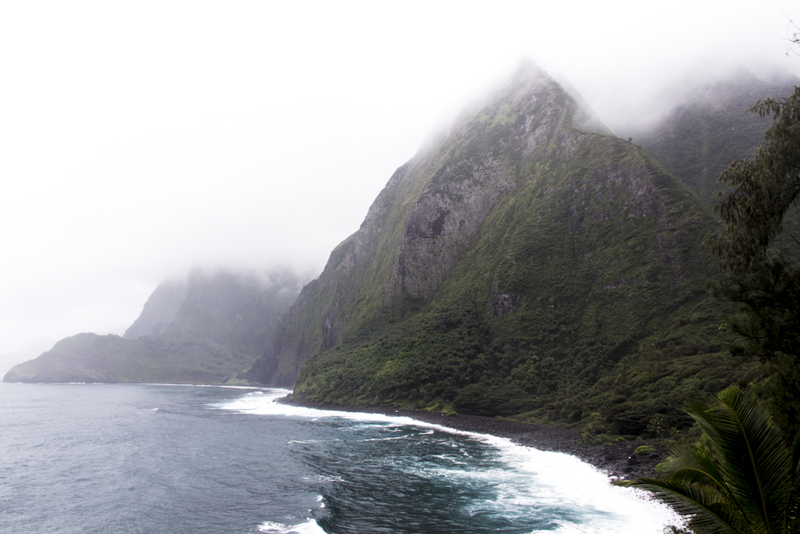 The isolated Kalaupapa Peninsula is eerie and mysterious. 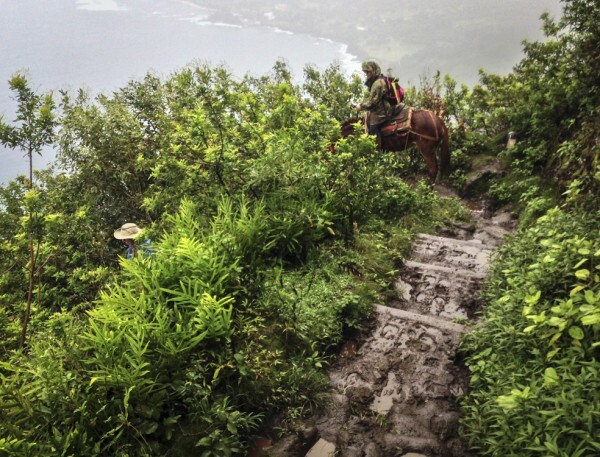 I realised that Moloka’i wasn’t set up to cater for typical holidaymakers when I learned that the number one activity for visitors is a mule ride to a leper colony. Not exactly something you would see in Oahu. But that’s what I loved about Moloka’i: there is no attempt to manufacture a brand for tourism. 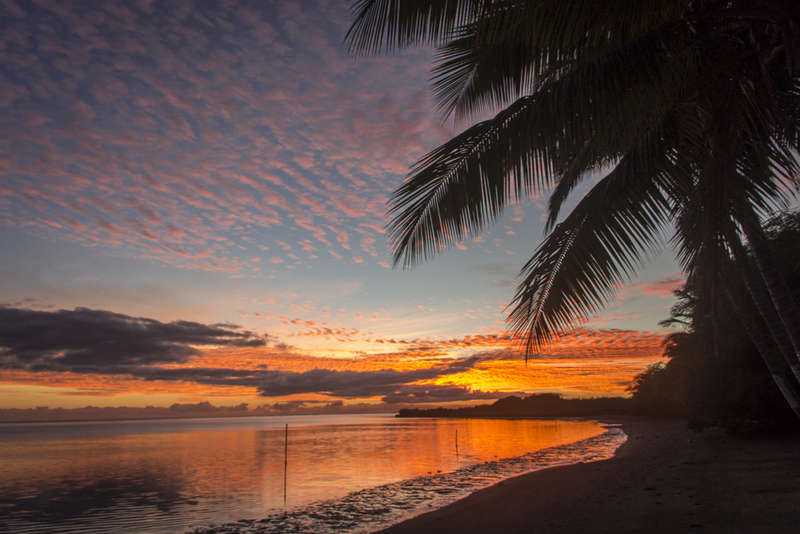 The people of Moloka’i live exactly how they want to live – in fundamentally the same way as they lived 50 years ago. Visitors are welcome to observe, and even invited to participate, but they are expected to learn about the history of the land, not just to sun themselves on its gorgeous beaches. I wasn’t kidding about the mules! One lifelong resident who fiercely protects the legacy of Moloka’i calls himself Anakala, which means Uncle and is a sign of respect to Hawaiian Kupuna (elders). Over the top of his T-shirt and flip flops, Anakala is wearing a red patterned Hawaiian robe, traditional beaded jewelry, a bone carving, and leaves draped around his neck. 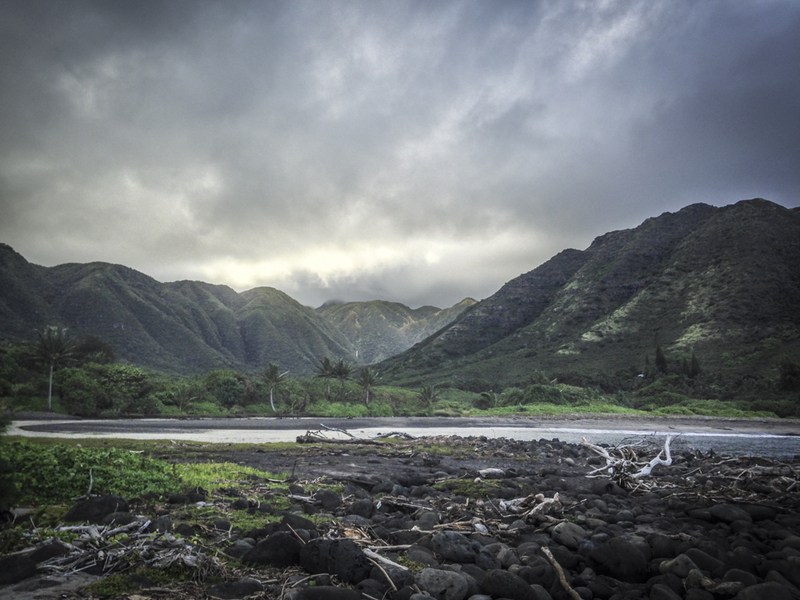 Anakala Pilipo explains why the people of Moloka’i don’t believe in development. “We believe the land has to breathe”. He pauses, trying to find the right words. “If it doesn’t, it will die”. In his right hand, he holds a large conch shell, the kind used to trumpet warning. 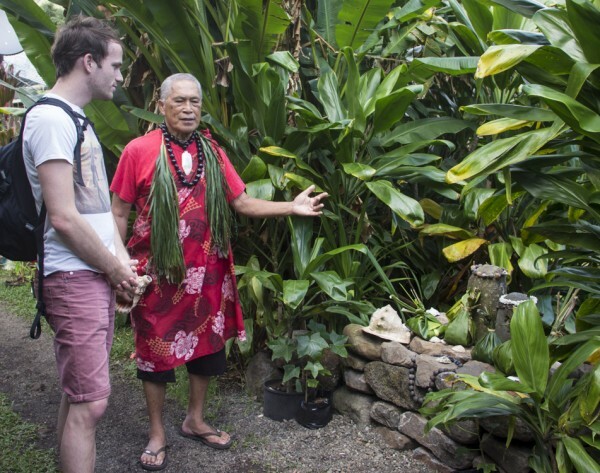 With his left hand, he gestures vividly as he speaks about the old life in Moloka’i. After the Hawaiian Kingdom was overthrown in the 1890s, it was illegal to speak the language or practice the traditional culture. Hawaii remained a territory of the USA for 60 years, until it finally became the fiftieth state in the shadow of WWII. Anakala gestures around him at the glade we’re standing in. He explains that this sacred valley used to have a school, and when he was a student the teachers would sometimes defy the rules and teach the Hawaiian culture. In 1946, when Anakala was just a young boy, disaster hit Moloka’i. He begins to choke up as he tells the small crowd who has gathered to hear his story, but he fights the swelling emotion with a determination to finish. The tiny fishing village and taro farms of the Halawa Valley were devastated by a large tsunami. From his place on high ground, Anakala watched his home and way of life destroyed by rampant waters. The school was never rebuilt. Anakala is the only remaining survivor of the tsunami in Halawa Valley. His burden to share the history is evident as he implores me to honour the story of this sacred place, then returns to his home, leaving his son-in-law to guide the small group to Ma’oula Falls in the heart of the Valley. Sean, our guide, leads us into a green wilderness that looks like a set from Jurassic Park. He appears to know every tree, rock and animal intimately. The trail is scattered with purple java plums and scarlet surinam shaped like bulging Chinese lanterns. Sean points out a tiny brown snake that looks like an earthworm. I would have walked past it. Likewise, dozens of tropical fruit trees I’d never have noticed. With a hunter’s knife he slices breadfruit, mountain apple, and lilikoi – like a yellow passionfruit – growing wild along the narrow dirt path. 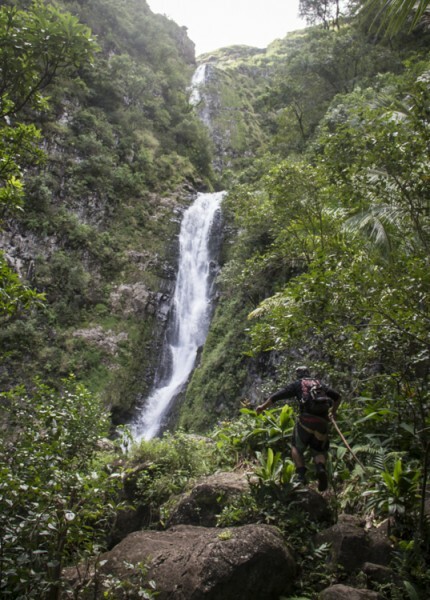 After an hour and a half walking under a canopy of trees, we reach the majestic Ma’oula Falls. I walk to the water’s edge, and balance on a large rock, just gazing at the tumbling water, and pondering. Sunset on Moloka’i is kind of alright too!